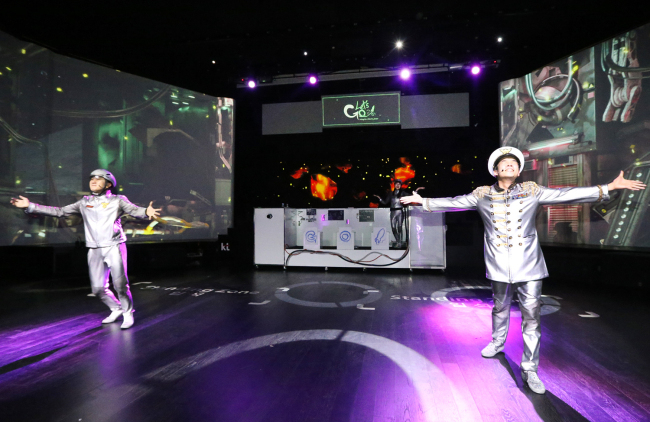 Network operator KT has unveiled a new hologram show that aims to attract global fans of Korean culture with lifelike 3-D technology. The new hologram show, dubbed “Let’s Go,” combines futuristic hologram technology with the real-life antics of performers. It comes after a virtual concert by K-pop star G-Dragon last year. “KT wants to create a new type of entertainment and expand the value of art,” said Lee Mi-yeoun, the vice president of KT’s virtual culture business team, at the showcase event of “Let’s Go” at Lotte FITIN shopping complex in Dongdaemun, Seoul on Monday. The vice president said KT plans to collaborate with various producers across different performance genres and it aims to open 20 hologram concert halls at home and abroad by 2020. “The hologram concert hall will become a platform to introduce various 3-D content to global markets,” the vice president added. The company opened a hologram concert theater in Singapore last month, where KT, entertainment agency JYP Entertainment and local partners held virtual concerts featuring K-pop bands including 2PM, Wonder Girls, and GOT7. 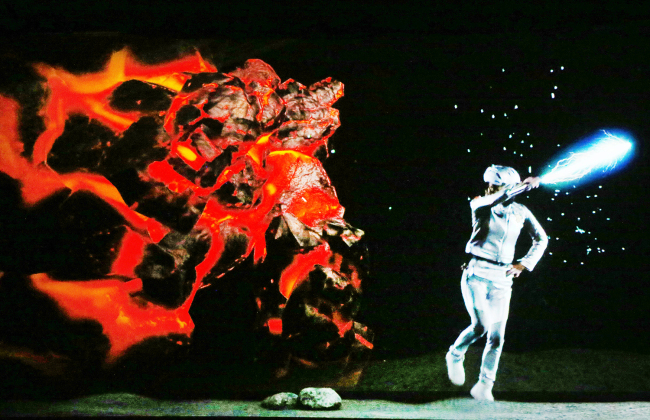 The virtual concerts will be also showcased at the Dongdaemun hologram concert hall in April. The telecom firm plans to open another 3-D concert venue at Triple Street shopping complex in Songdo International Business District, Incheon in January next year. For the “Let’s Go” stage performance, KT has joined hands with stage play company Drawing Show. Drawing Show is in charge of orchestrating the entire hologram show, featuring three space travelers visiting different nations including China and Iceland. “This show is an experimental project as it merges advanced technology with drawing,” said Hong Sang-jin, the director of the hologram show. During the hour-long preview on Monday, three actors and actress showed quirky, and joyful, dance moves which were combined with lighting technology. They encouraged the audience to be part of the show, asking some of them to come to the center of the hall to dance. The audience was also asked to shout together to beat virtual space monsters, which could only be destroyed with loud voices. KT gave technical support, such as displaying computer graphics mixed with the faces of the audience, and real-time interactive images of the audience on 180-degree screens. In order to provide an immersive experience, air blowers were installed around and over the audience seats. Since its launch in 2014, the Dongdaemun hologram concert hall has attracted 200,000 attendees. Tourists accounted for 45 percent of this number, as of January this year.